Bradycardia is a slow heart rate (60 beats per minute or slower) that does not meet the body's metabolic demands. Symptoms of bradycardia include dizziness, extreme fatigue, shortness of breath, or fainting spells. This can be compared to tachycardia which is an extremely rapid heart rate, usually signified by a pulse of over 100 beats per minute. Adults usually have a resting heart rate of 70-80 beats per minute although well-trained athletes can have resting rates in the 50's or 60's. Newborn babies have a normal heart rate of 120-160 beats per minute. A slowed heart rate can lead to a variety of other problems but treatment may not be necessary if the patient has no other symptoms. If you experience sudden bradycardia or any of the symptoms associated with it, contact your physician or emergency room immediately. 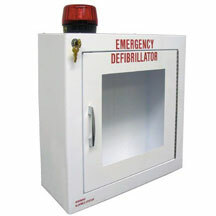 Get your AED cabinets and signs from Safety Emporium. This term usually appears on an SDS as a symptom of exposure. First aid treatment may include administration of oxygen or treatment of the underlying cause(s) with drugs such as atropine. Examples of chemicals that may cause bradycardia include sarin (a potent neurotoxic chemical warfare agent), phosgene, many common pesticides, certain halogenated organic materials, high levels of cyanide (often as a combustion byproduct in fires), and many more. While sudden bradycardia can be brought on by exposure to certain chemicals, bradycardia can also be caused by other factors such as sleep apnea, certain heart medications (such as beta-blockers), and electrical anomalies in the heart. Therefore, one should keep an open mind in trying to find the cause and work closely with a medical professional to assess and, if necessary, treat the condition. Bradycardia and Slow Heart Rate at the American Heart Association. Sinus Bradycardia (technical) at eMedicine.com. Bradycardia (Slow Heart Rate) - Overview at WebMD. Bradycardia, a multi-page article at MayoClinic.com. See also: hypoxia, syncope, tachycardia. Entry last updated: Monday, February 12, 2018. This page is copyright 2000-2019 by ILPI. Unauthorized duplication or posting on other web sites is expressly prohibited. Send suggestions, comments, and new entry desires (include the URL if applicable) to us by email.